the winking social critic his reputation has earned for him to earnest heart-on-his-sleeve sentimentalist!" and it's told by a master storyteller. "Dykstra Paints a Portrait of Stunning Detail!" "Touching in its Honesty and Simplicity!" 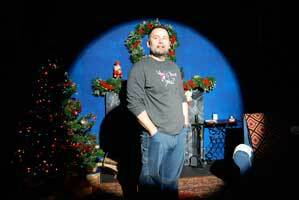 "Dykstra is neither Marley nor Scrooge. 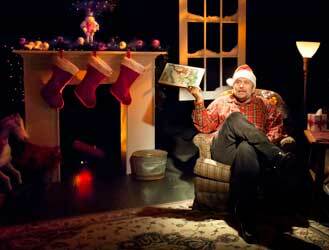 Dykstra reconceptualizes Santa as an omnivorous corporate predator who owns the holiday. This is not St. Nick, Kris Kringle or Father Christmas but rather a pompous Grinchwith a red hat and a pot belly who seeks to maximize the franchise so that girls named Holly and Noel would have to pay a licensing fee to hold their names. 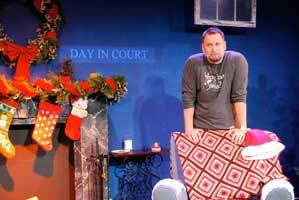 Once the outrageousness of the notion is on the floor, Dykstra raises the stakes by bringing Santa and his legal team into conflict with another big man of a different color, the Jolly Green Giant. Not only is this a rival marketer with a lot of muscle, but his tagline sounds like copyright infringement three times over, "Ho! Ho! Ho!" This rises to a corporate battle of the titans until the shocking (well, startling) denouement." 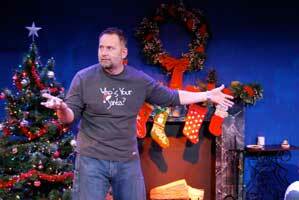 “The energy in Brian Dykstra's plays and stage persona is very specific. For one thing, he looks like he'd be more at home at a sports bar, or parked in front of a wide screen TV on Sundays, telling each player how to retool his or her strategy. 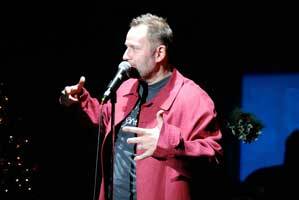 But in Dykstra -- who's a veteran of Russell Simmons' Def Poetry franchise -- there are no airs and no pretensions. He emits a tough-guy honesty, a mixture of don't-fool-with-me and show-me-what-you-got. 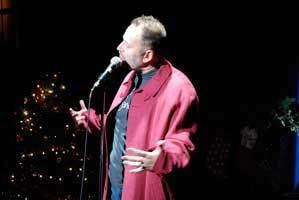 He's Everydude, which means he can do anything on stage, and very often he does. 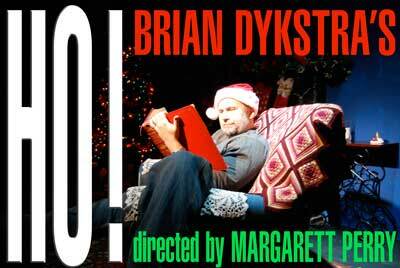 Take his latest play, a Yuletide rip called Brian Dykstra's Ho! First, it takes guts to pop your name in front of a title, but it's good marketing: Something about the guy makes you want to hop on the ride, knowing you're going to catch some cool and sardonic sights along the way. HO! 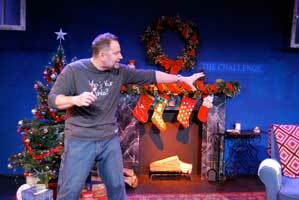 has several possible definitions and Brian Dykstra puts them all to good use in his two-monologue show that finds both the irony and true meaning of the season. Santa's World is a rhyming rant of corporate greed, pitting a less-than-jolly Santa against a bitter Jolly Green Giant over usage of the catch phrase "Ho-Ho-Ho!" 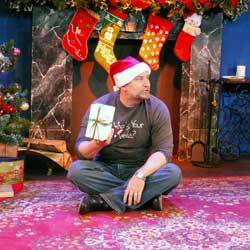 Dykstra's imaginative product placement is as dazzling as a set of blinking Christmas lights. 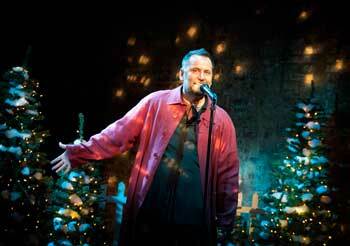 The mood shifts in A Christmas Tree Story, an urban myth about Sammy the Vermont pine. He has waited his entire life to be the perfect Christmas tree, and the unexpected turns in this deceptively simple tale has the makings of a memorable, oft-recited, Christmas tale. Dykstra turns the typical children's holiday story on its head in Act I with a Dr.Suess/Shel Silverstein-style poem about the commercialization of Christmas--Santa Claus sues the Jolly Green Giant for the use of the phrase Ho! Ho! Ho! It’s packed with holiday characters you’ll never forget. 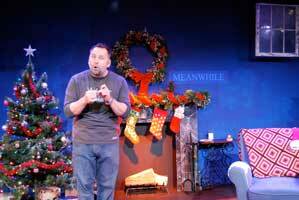 The second act is the charming tale of a Vermont Christmas tree in the big city. 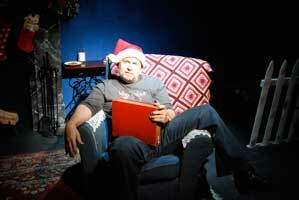 And just as the Grinch's heart grew three sizes one night, so does Dykstra's flare for a heart-felt tale about the true meaning of the holidays.